Whether you are collecting books, clothes or other items, having the proper donation bin set up at your storefront or in other locations throughout the community is one of the keys to success. 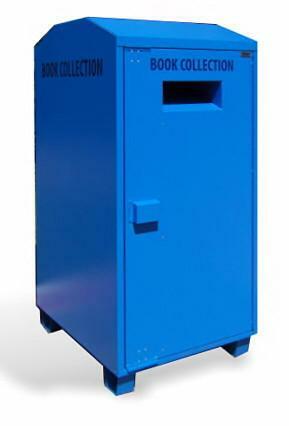 At Securr, we offer a number of different collection bins from which you can choose. Here is a look at just a few. If you need a clothing collection bin to be placed inside, model CB21G18 may be just what you are looking for. Heavily constructed with corrosion-resistant materials and a high-grade powder coat, this model features an easy-to-use loading shoot, a shrouded and lockable latching mechanism and full-length stainless hinges with dual point locking mechanisms. The units can also be bolted together or can be ordered with the optional Maxi-Mover wheeled card inside. This model weighs 375 pounds and measures 36 inches wide, 47 inches high and 54 inches long. In addition to some differences in sizes, the differences in these models are also primarily in how the bin accepts donations. The models with just a chute opening, for example, feature an easy-to-use chute with a shrouded and lockable latching mechanism. The models with the gear driven rotating tray, on the other hand, provided an extra layer of security with their theft-resistant gear-driven loading chute. The models with the spring loaded rotating tray offer a similar form of theft-resistance with their spring-assisted loading chutes. Regardless of the style of collection bin you wish to purchase, all of the models can be bolted together for additional security and ease of use. All of the units are also made with 16 gauge galvanized steel and can be bolted directly to the ground. If you are interested in collecting book donations or if you need a bin that customers can use to return books that you have borrowed, the book collection bin (model number CB285) offered by Securr will get the job done. This heavily constructed bin is made from corrosion-resistant materials and a high-grade powder coat to provide extra durability and longevity. Internally reinforced for additional strength, the bin has a shrouded and lockable latching mechanism for added security. To aid in the process of collecting books, an optional cart can also be added for use with the collection bin. Measuring 31.5” wide, 40” deep and 40” high, the cart comes complete with casters and can be fit 3 abreast in a truck. 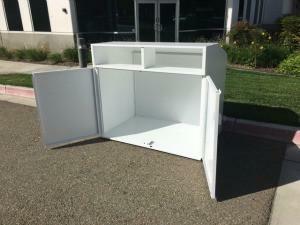 Rated at 900 pounds per caster, the cart features removable side panels for easy access to all of the books inside.